Last edited by Nhoise on Mon Jan 04, 2016 10:28 pm, edited 1 time in total. We will make the 55k I'm optimistic. 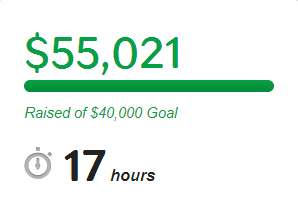 $ 2.793 and 46 hours left. Last edited by Nhoise on Mon Jan 04, 2016 10:24 pm, edited 1 time in total. Oh, and welcome to the forums zero51! Gustaw wrote: Oh, and welcome to the forums zero51! Thanks! Hanging around on the Raptr thread was fun so I thought I may as well join the forums too. Congrats on the 55K, guys. I was just wondering, as somone who likes giving out money to projects I think are interesting, and as somone with a lot of money to spend, 5000 dollars for all the perks would have been very tempting if its for something I believe in anyway. But do you guys know that you have only a moral but not a judicial obligation(as far as I have understood it form the indiegogo website to finish the project or even use the money for any such thing. Probobly. Somewhere in the background. Of course this can always be contested but I am glad I have so far not invested in anything the like. Let s see how this turns out. Not be spreading bad karma but I believe there is a certain danger when game producers(or producers of anything) are not bound to a contract with a "higher order" who dishes out. Of course creative freedom is paramount but the obligation to deliver cannot be subjected to personal interests at the moment. These kind of projects and possiblities for others in this are of financing, will stand and fall with the reliability of those receiving the money and I am as of yet questioning this whole thing. By the way, what happens to the 17.000 dollars you people got as a "bonus"(?). An answer to this question would be very helpfull. Sorry for this whole thing but I do believe it is important for the future. Otherwise we are going to have another financial meltingdown meltdown bubblebursting armagedon.